@moldynolds So we can have the conversation away from prying eyes I made you a private thread over in my game folder. Pop on over when you have the chance. Why do you hate prying eyes so much?! Well, it's a good way to keep this thread on the front page - doing all the discussions about race and character in here - but it'd just clutter up the thread. Also some people may not want to have their ideas scrutinised publicly, which is why feedback is (almost always) put into secret tags anyway. Also all the "results" of the talks are visible in the game thread in the racial descriptions and character sheet thread. People are welcome to read along with game threads too, which are very rarely secreted. One is currently, but that was more about keeping spoilers away from the main group. We are technically still open for applications - since I am bad at turning the few players away that want to dip their toes into gurps. I am surprised to have received three applicants as it is, and we will probably be starting a second group to explore some different geographical location before heading to the focal point of the larger story. I'm interested to learn GURPS! I've never had the chance to play it as it was... before my time? No offense meant I'm also showing my ignorance here, since it probably never got stopped playing anyway. If I understand correctly, you're forming a new group of players? Do you only need a race and a starting concept from players? What would the game be like, in terms of setting & expectations? We do play a lot of gurps in the retirement home, you are correct. But in all seriousness - the system just had the freedom to create anything and the right kind of complexity to have slightly more gritty combat. Then I just dragged a few people down into my madness, and here we are. It would appear that way, though it wasn't entirely planned. I thought I would have less interest, but since I got three people bringing in some good ideas I thought I might as well roll with it. And since their characters are all originating more or less from the southwest (of the extract map that's floating around in the game thread) I thought I could use this opportunity to explore this region of the world with them. But this group is not in a parallel dimension, just a different place for a bit. The themes and global happenings remain the same, and some things should tie in to the bigger picture - though probably not everything. Eventually everybody might link up, or at least move to the same location. So if that is something that interests you then you have the option of pitching as many ideas for races as you have, but you don't have to. There are a good few races that could still do with a player. And as for concept you should orient yourself by what the new players are bringing so you have a place to fit in: An honourable swordsman and shadow mage, a deep sea prince and a lecherous wandering sorcerer (just rough summaries obviously). Hello Phettberg. I remember having fun gaming with you. You had a very cool halfling in a game I was in (sadly interrupted by a hurricane). This game sounds very good and I have been reading GURPS lately. I imagine you have filled the spot, but I am going to cook up a character anyway. Even should it not be used it will be fun to make something for GURPs. If you still have room for a submission do let me know and I will sling it your way. Regardless, good to see you. Hey there OldeHob. Sure, I remember. I technically still have that halfling, as that game is still ongoing. I don't have a set number of spots - I'd consider everybody that has an idea and writes it out. You'd have to make the same decision as Hundur above: To pick an already existing race, or to rustle one up yourself. And then you have to remember the three characters that are already in group two (electric boogaloo), so we don't overload on similar concept. I will check out all the rules again and give some serious thinks as not to make something that won't fit. I have the day off. Maybe i can hit something up by days end. I felt like giving this one more bump before I descend back into the ancient tomb of gurps with the stolen souls of those I have lured into their demise - for evermore? Probably not, I'll surely be back in another six months or so. We've got a second group now, three wonderful and diverse characters: A near-human master of the blade in search of fame, a lecherous goatman sorcerer on the run, a deep sea whaleman Prince about to establish diplomatic contact with the surface world. The three are about to experience the wild land of Ezen, where clans and bandits wage war upon each other while an obsessed geriatric emperor tries to fix the blood moon through any means necessary. Sounds interesting? We have space for you too! Make a race, pick a race, whatever you want. I can take up to two people still easily, maybe more. I play no favourites. OldeHob, you're still invited also! The story will begin soon, but interested people can join in at any time. I'll make it work. The ad will still be open for another week. Last edited by Phettberg; 04-14-2019 at 04:56 AM. Race: Ratkin are small, rodent-like humanoids; originally native to subterranean areas in dry deserts and plains, they are now more often found in nomadic trading caravans. Much like the pack rats they resemble, ratkin are tinkerers and hoarders by nature, and as a whole are masters of commerce, especially when it comes to acquiring and repairing mechanical or magical devices. Though some are shrewd merchants who carefully navigate the shifting alliances of black markets and bazaars, many ratkin love their stockpiles of interesting items far more than money, and would rather trade for more such prizes to add to their hoards over mere coins. It’s common to see a successful crew of ratfolk traders rolling out of town with an even larger bundle than they entered with, the whole mess piled precariously high on a cart drawn by giant rats. Typical ratkin are average 4 feet tall and weigh 80 pounds. They often wear robes to stay cool in the desert or conceal their forms in cities, as they know other humanoids find their rodent features distasteful. Ratkin have a strong attraction to shiny jewelry, especially copper, bronze, and gold, and many decorate their ears and tails with small rings made of such metals. They are known to train giant rats, which they often use as pack animals and mounts. 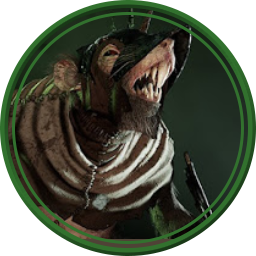 Society: Ratkin are extremely communal, and live in large warrens with plenty of hidden crannies in which to stash their hoards or flee in times of danger, gravitating toward subterranean tunnels or tightly packed tenements in city slums. They feel an intense bond with their large families and kin networks, as well as with ordinary rodents of all sorts, living in chaotic harmony and fighting fiercely to defend each other when threatened. They are quick to use their stockpiles of gear in combat, but prefer to work out differences and settle disputes with mutually beneficial trades. When a specific ratkin warren grows overcrowded and the surrounding environment won’t support a larger community, young ratkin instinctively seek out new places in which to dwell. If a large enough group of ratkn immigrants all settle down in a new, fertile area, they may create a new warren, often with strong political ties to their original homeland. Otherwise, individual ratkin are inclined to simply leave home and take up residence elsewhere, or wander on caravan trips that last most of the year, reducing the pressure of overcrowding at home. Character: Quark was born in the sewers of a major metropolis. He and his clansmates were ruled by a gang of wererats. They competed with the thieves' guild for control of the criminal enterprises found in the foreign quarter and slums of the city. Like most of his kin, Quark was trained as a thief. Unlike most he was trained as a burglar rather than a cutpurse or extortionist. Quark hated the wererat overlords and escaped the city at the first opportunity. Being a social creature like most ratkin, he quickly joined the first group of humanoids that would have him. Last edited by Gualdarrama; 04-14-2019 at 08:46 AM. Right, thank you for the application. Hopefully this is not too direct, but I have to tell you that I am not accepting ratkin. They have been done before, in more than one system and setting. If you can search "XYkin" and find (sometimes multiple) versions of a racial profile made for d20, then it's probably not for this setting in its current state. We have a fair amount of relatively straight-forward anthropomorph races (or those comparable to existing material) already, I only want additional ones that would be unique to this setting. The way I would approach it is ask yourself what you've never been able to play, and try to make that. So you know - I don't want to be discouraging at all. We can make something else work. An option that you have is trying to take a ratkin and give it some twist that makes it something of your own again. It could be culturally deviating from the ratman trope, or physically, or preferably both. Say a ratperson - but they have wings and are solitary apart from the mating season. Or friendly, truthful and cooperative ratmen with a penchant for mysticism, secluding themselves and pondering the mystery of the universe instead of infighting and trickery. But I have to say in general, for the above reasons I would prefer if we spun these things around a different rodent (or marsupial maybe) base than rat. The character type you are proposing would fit with the group though. Last edited by Phettberg; 04-14-2019 at 09:29 AM. What about anthropomorphic Rabbits from a Samurai era like culture from a desert region. The noble caste is split between the True Bones (landed nobles) & Head Ranks (landless nobles). The True Bones and Head Ranks who are courtiers, artists, priest and government functionaries far outnumber the warriors(Bunshidos) who ride into battle on double humped cataphract camels with the lead rider wielding a Naginata (glaive) and the rear rider (who is always Head Rank as True Bones would never want to seem as not being the owner of the camel) with light crossbow. Most Head Ranks can't permanently afford a camel so ride ones owned by the True Bones they are vassals to. 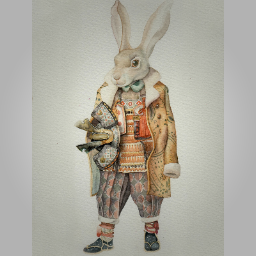 The Cottontails (non-nobles) make up the bulk of the society. Due to constant fighting among the clans more and more Cottontails are being recruited as Leporidae (peasant foot warriors, by law every Bunshido may recruit up to 7 retainers but in practice most Head Ranks can only afford to maintain one or two) who wear scale mail and form in units made of pikemen or shortbowmen. The Shibune Clan is regarded as the most dishonorable clan as they hire themselves out as scouts, spies and saboteurs. Within the walled cities the Bunkuza (Thieves' Guild) are a relatively new menace but mainly keep their crimes within the Cottontails. It is a crime for any Cottontail not a Leporidae to wield weapons other than a knife. Often Cottontails carry certain tools and walking staffs as they are technically not weapons under the law. Scimitars (worn by the Bunshido) and Shortswords (worn by all members of the noble caste even if not warriors) may only be carried by the noble caste. The Painted Monks (who are former Bunshido permanently dyeing parts of their fur in esoteric symbols) mainly live in out of the way places where they can live a contemplative life- though they still practice their martial skills albeit focusing on their hands and feet instead of weapons. Finally, arcanist are part of the lower caste but unlike other members of the caste may not live within cities and towns on penalty of death and so are generally hermits. They are often referred to as Forbidden Ones. Last edited by Gualdarrama; 04-15-2019 at 12:56 PM. Sure, that's something we can work with. I do have a good amount of notes, but I'll get you over into a private thread to discuss details. With one group of five players and another with four to five as well we are now again closed. But I can't say no to people. If you are interested feel free to send me a pm and we can see when we can squeeze you into the game.